There is a prevailing paradox about the jungles of south India—that they are lush and alive in the monsoon, but dreary too, since wild animals, searching for shelter, stay well away from prying human eyes. But the monsoon is when forests are born anew, and, for the fauna, this is a season of plenty. Yet not everyone gets to witness this season of rebirth. Most Indian national parks and reserves stay shut during the monsoon, partly because the forests need time away from humans to rejuvenate. This is the time many mammals and some bird species mate or give birth. There are, of course, challenges to navigating the terrain during the rains. It is difficult for vehicles to grip the dirt tracks that run through the reserves. Imagine if a safari jeep’s wheel were to get stuck in the wet soil while being chased by an agitated tusker. What would make things trickier is the dense undergrowth, which can hold an element of surprise for both humans and wild animals. Parthenium and other weeds grow quite tall on either side of the tracks, making it almost impossible to see even the antlers of the spotted deer, let alone animals like tigers and leopards, says naturalist and wildlife rescuer Vinay Prathap Jadhav. Of course, anyone who likes safaris will agree that spotting a wild animal that had been camouflaged by foliage only seconds ago is more exciting than, say, seeing it from a mile away. But wild animals, particularly elephants and sloth bears, do not like being taken by surprise. When surprised, their reflex is to defend themselves by fighting rather than fleeing. Elephants are more sensitive to sound, making it crucial for human beings to stay quiet on safaris. For sloth bears, their short-sightedness ensures that their defences remain on high alert. So, being in a vehicle that is stuck, or, worse, broken down, can turn a beautiful adventure into a nightmare in seconds. “Our jeep broke down at sunset (one safari) and we were surrounded by a herd of agitated elephants," says Shaaz Jung, a naturalist and leopard tracker whose family runs The Bison Resort in Kabini, near the Nagarhole reserve in Karnataka. “We had no network to call for help. Our guests were terrified. To listen to the jungle and not be able to see it (in the dark) is a frightening experience." But once you get past those challenges, going into the wild in the monsoon can be an experience that will last a lifetime. Take, for instance, the landscape of the jungles in the monsoon. South India has various types of forest, ranging from dry deciduous to moist deciduous and evergreen. There are variations even within a single reserve, and the landscapes change with each season in many areas. For instance, the dry deciduous parts of Nagarhole go from brown and dusty to green and lush in a matter of days after heavy downpours at the start of the monsoon. In the Nilgiris, a host of plants come to life. “Some remain dormant, like a bulb in the ground, and only when it rains, and the monsoons start, do they emerge every year," says Godwin Vasanth Bosco, a restoration ecologist and independent researcher, based in Ooty. “They flower and then they wilt again. For example, impatiens (touch-me-nots) is a genus of flowering plant with some of its species endemic to the Nilgiris. These are extremely rare plants, whose whole life revolves around the monsoon." The most popular of the monsoon blooms this year, though, is the neelakurinji. 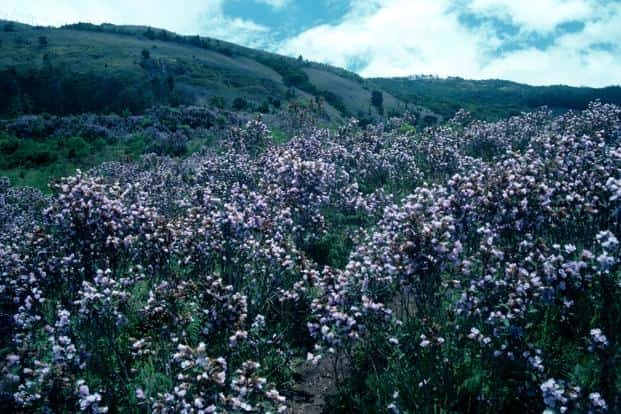 The purple-blue neelakurinji, which gives the Nilgiri Hills their name, flowers once in 12 years. It is essentially a monsoon bloom that lingers on until the winter, or even until the next monsoon arrives, in some cases. The flowering of the neelakurinji this year, which will continue until October, is expected to bring hundreds of thousands of tourists to places like Munnar and the Palani Hills in Kerala and Tamil Nadu. Munnar’s Eravikulam National Park is one of the best viewing spots for the flowering. Tourists will throng to see and take pictures of blankets of blue, and will probably be photobombed occasionally by the Nilgiri tahr, a stocky goat with curved horns that inhabits the park. Since the neelakurinjis flower en masse, even the honey that bees make from their nectar is said to taste different. And as the flowers make an appearance only once in 12 years, the highly sought after honey is collected by tribes like the Jenu Kurubas (jenu means honey in Kannada) of Karnataka and the Kurumbas of Tamil Nadu. It is sold and marketed with the help of non-profit organizations, such as the Keystone Foundation, as kurinji honey. As the landscape changes in the monsoon, it brings about a key event—the mass return of elephants to the dry deciduous parts of the forest. In the summer months, it isn’t unusual to find a sudden increase in the elephant population in some parts of Bandipur and Nagarhole in Karnataka, Gudalur in Tamil Nadu and Wayanad in Kerala. Elephants typically migrate to the moist deciduous landscapes within these reserves during the summer months. Come monsoon, many make their way back to the dry deciduous areas within those reserves, and into areas like Mudumalai and the Sigur Plateau in Tamil Nadu. It is to the elephants’ lumbering migrations that the whole forest adapts, and, like all other species, elephants thrive in the monsoon. A healthy elephant population is crucial for maintaining the balance of the forest. Elephants help cart seeds when they migrate from one part of the forest to another. This happens in several ways—through half-chewed foliage that falls out of their mouth, through their excreta, or through seeds that get stuck to their feet. This spreading of seeds is more effective in the monsoon, as the climate is ideal for many to bear shoots. While there is no single identifiable mating season in India, the monsoon is a preferred time for many species. “Because of greater availability of forage for herbivores or increased abundance of insects, many birds and some mammals tend to have breeding seasonality that takes advantage of these factors to raise their young in this time of relative food abundance," says K. Ullas Karanth, one of the world’s foremost authorities on the tiger. Karanth, who lives in Bengaluru, is the director for science (Asia) at the Wildlife Conservation Society, headquartered in New York. The monsoon is so bountiful that even the nocturnal sloth bear can sometimes be spotted during the day. In the tea estate-filled landscape of Valparai in the Nilgiris, a family of sloth bears is even known to take up residence in a rundown hut to shelter from the rain, and to be closer to human habitation. Where there are humans, there are bound to be lights, and where there are lights, there are bound to be insects. While the sloth bear’s regular diet consists of insects, termites and ants, the rains help add variety to its diet with an abundance of fruits. An increased availability of food brings with it even rarer sights in some areas. In the Congress Mattam (mattam means level or flat land in Tamil) area on the Sigur Plateau, hundreds of herbivore species sometimes gather on the sunken plateau filled with grass, from the largest tusker to the smallest chital (spotted deer), the colourful peacock to the sombre gaur. The agenda is simple: to eat as much as they can after a tough, dry summer. The Sigur Plateau acts as a bridge between the Western and Eastern Ghats. It is an important animal corridor in the Nilgiri Biosphere Reserve, one of the most biodiverse regions in the world. But there aren’t too many people who know of the herbivores’ meeting spot. In any case, most people wouldn’t be able to visit this unusual African savannah-like flatland, surrounded by the dense jungles of three states—Tamil Nadu, Karnataka and Kerala. It is not in the tourist zone, nor is it connected by road. 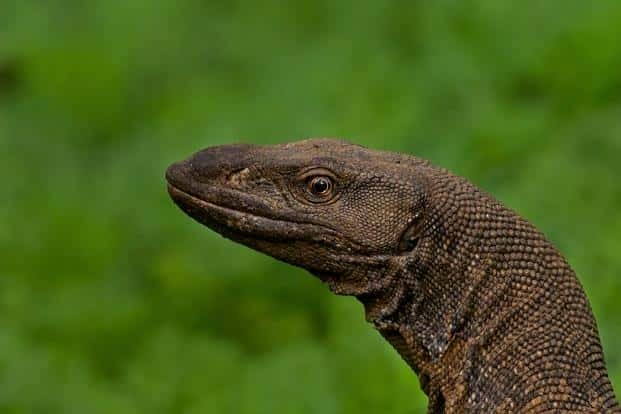 Only ecologists and researchers who work in the region have had the good fortune of witnessing this spectacle, including those at the Shola Trust, a non-profit involved in the conservation of the Nilgiris. The southern jungles typically have thicker undergrowth than their central and northern Indian counterparts, making sightings that much tougher across seasons. In summer, however, animals tend to linger in the tourist zones, where many of the waterholes are located. While elephants and other herbivores don’t seem to mind the rains all that much, big cats live up to the feline stereotype—they hate getting wet, so they are never seen. Sometimes—not often, admittedly—they break that convention. And Mithun Hunugund knows they do. The forests of Nagarhole, along the banks of the Kabini, have been his second home for 15 years. Hunugund works at a digital marketing agency in Bengaluru, but is often found playing the role of safari guide or naturalist at The Bison Resort. “Recently, just as we started the safari it began pouring, and usually people say you won’t see anything then. But I went in because the forest is so enchanting in the rains," says Hunugund. Hunugund hadn’t even crossed the main entry check post of the Rajiv Gandhi National Park in Nagarhole when he saw a leopard with her cub on a tree. It wasn’t just luck. He knew enough about leopards to look for them among the canopies of trees. “They love to sit up in the teak trees, which have broad leaves and act like natural umbrellas for them. And when we went just 100m further into the forest, we saw Kismet (a four and a half year old tigress) with her three small cubs. We even got to see the cubs playing in the water. It was a safari the likes of which we wouldn’t expect even in summer," Hunugund says. The three cubs were Kismet’s very first litter. Big cats almost never allow their cubs to leave the safety of their territories deep within the forests, not until they are at least 10 months old. Kismet’s cubs, Hunugund estimates, were only three months old. That’s another secret about the jungles of Nagarhole. Many of its big cats can be individually identified and have even been christened by wildlife enthusiasts, naturalists and the forest department officials of the region. The Bison’s Jung is credited with coming up with most of those names. And it so happens that his journey tracking leopards began on a monsoon evening a decade ago. Scarface, Jung’s favourite leopard, and king of parts of Nagarhole today, was finding his feet as a shy youngster back then. On that rainy evening, Scarface allowed Jung into his forest, and, unknowingly, introduced an entire generation of leopards to the humans of Nagarhole, including individuals like Cleopatra (Scarface’s preferred mate), Torn Ears, Monk, Marble and Mist. But ask anyone who visits Nagarhole, whether naturalist or tourist, which animal they really want to spot, and their answer will most likely be the same. The sole black panther of Nagarhole, who, contrary to his non-melanistic leopard friends, doesn’t go by any one name among the community of wildlife enthusiasts in the region. He has been called BP, Bagheera, Blacky and Ghost. No other big cat has debunked the myth (that felines can’t be seen in the rains) as much as he has recently. Several naturalists and wildlife enthusiasts have seen him even in the pouring rain over the past month. 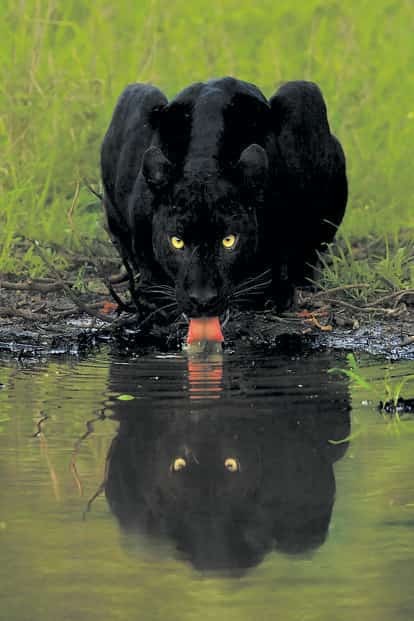 And many agree that if there is one image that repeatedly draws them to the jungles, even in the risky monsoon, it is this—seeing the panther’s hypnotic green eyes and inky black frame set against the rainy landscape of Nagarhole. For them, this is the essence of the beauty of the south Indian forests in the monsoon.